CADA SETMANA TENIM UN JOC DE TAULA PER A JUGAR. INTENTO QUE ELS JOCS TREBALLEN EL PENSAMENT LOGIC-MATEMATIC I L'ATENCIÓ. 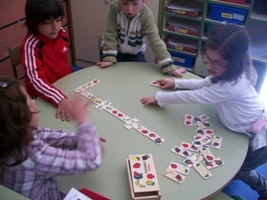 AL PRINCIPI TOTS JUNTS JUGUEM A L'ESTORA PER APENDRE. DESPRÉS FEM GRUPS I ANEM A JUGAR I AL LLARG DE TOTA LA SETMANA QUAN TENIM UN POQUET DE TEMPS TAMBÉ JUGUEM , AQUESTA SETMANA HEM JUGAT AL DOMINO.